Lawler, the former welterweight world champion, was outclassed and comprehensively beaten in a scintillating display by the former lightweight kingpin dos Anjos. In the lead up to the bout, there were few who could confidently separate both men. Betting odds also suggested that we were in for a close battle between both men yet the fight was completely one-sided, as evidenced by the impressive clean sweep of 50-45 on all judges’ scorecards. The manner of the Brazilian’s performance is bound to see him solidified as the outstanding candidate for the next shot at 170-pound champion Tyron Woodley. 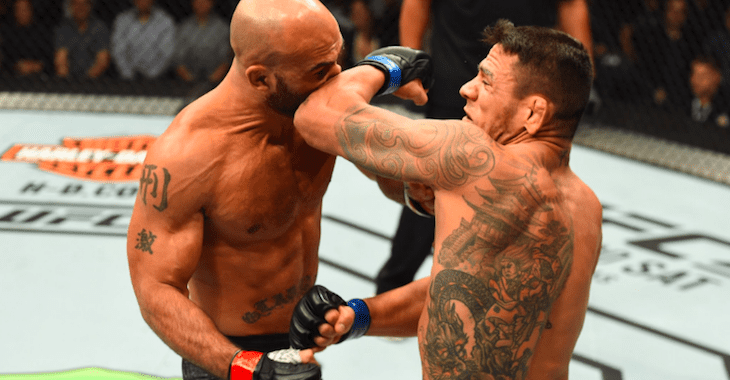 In an utterly dominating performance, dos Anjos relentlessly pressurized, suffocated and effectively negated Lawler’s attributes and gameplan. Kicks to the lead leg and vicious hooks to the body broke “Ruthless” down and dos Anjos’ record-setting 40-punch combination summed up his night. For dos Anjos, he has now proven himself to be a genuine contender among the elite at 170-pounds. With all eyes looking his way, the 33-year-old has already been called out by fellow top-rankers such as two-time challenger Stephen “Wonderboy” Thompson and loud-mouthed upstart Colby Covington. “Sad Performance by the JV Squad on FOX for #UFCWinnipeg. RDA couldn’t even finish a broken old man! Tyron’s faking injuries. I’m here to make this division great again. Rafael dos Anjos step up and defend that dump you call home and fight me for the interim title you filthy animal,” Covington posted. Woodley will undergo shoulder surgery which could potentially lead to a lengthy spell on the sidelines for the champion. Covington sees a fight against dos Anjos for an as yet unconfirmed interim title in Brazil. Should Woodley’s recovery indeed take longer than a few months, then Covington’s claim to an interim title bout suddenly become considerably more possible. The promotion seems eager to encourage rather than look down on the trash-talk and pantomime style villainous behavior of “Chaos”. “I’ve been in fight camp for the last six months,” dos Anjos said. “I need some time off, too, to go home and get better and have a little longer camp to prepare for a title fight. “I think when (Woodley) fought Demian (Maia), he was worried about takedowns only,” dos Anjos said. “When he fought (Stephen) ‘Wonderboy’ (Thompson), he was worried only about stand-up. I think with me, he’s got to worry about everywhere. He’s going to have a lot of things to worry about.